1. Inspect the 4th and 5th clutch pistons and the clutch piston check valves (A). 2. If the clutch piston check valve is loose or damaged, replace the clutch piston. 3. Check the spring retainer for wear and damage. 4. 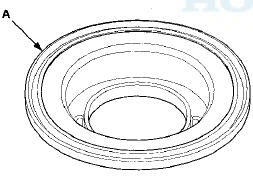 If the spring retainer is worn or damaged, replace it. 5. Check the oil seal (A) on the spring retainer of the 1st, 2nd, and 3rd clutches for wear, damage, and peeling. 6. If the oil seal is worn, damaged, or peeling, replace the spring retainer. 7. Inspect the clutch discs, the clutch plates, and the clutch end-plate for wear, damage, and discoloration. 8. If the clutch discs are worn or damaged, replace them as a set. If the clutch discs are replaced, do the clutch clearance inspection (see page 14-304). 9. If any clutch plate is worn, damaged, or discolored, replace the damaged plate with a new plate, and inspect the other wave-plates for a phase difference (see page 14-304). If the clutch plate is replaced, do the clutch clearance inspection (see page 14-304). 10. If the clutch end-plate is worn, damaged, or discolored, do the clutch clearance inspection (see page 14-304), then replace the clutch end-plate.